There's a saying, "If you've met one foundation, you've met one foundation." That's true. Funders have different priorities. They're different sizes. They all have different trustees and different sized staffs (if they have staff at all). They also have different ways of making decisions. Yet one thing that all funders have in common is this: there's usually a method to what might seem like madness when it comes to their decision-making. Understanding the process from a funders' perspective can help you in your overall grantseeking process. The article listed the organizations that had received funding - by name, by request amount, and by award amount. It also explained their funding and decision-making process. I loved learning that this community invests in its local nonprofits. I loved reading how they report back to their neighbors exactly how they're reinvesting in the community they share. And I loved the transparency of this article. It offered a rare glimpse at how this particular grantmaker made its decisions. This town has a clear policy for how much money it will set aside for charitable purposes and how that amount is calculated. "The town allocates up to 30% from the change in the fund balance of the general fund each year, not to exceed $150,000." This year, the maximum amount was available and, in fact, they approved $149,711 in awards. "Traditionally, applicants were required to make formal presentations before the Ways and Means committee for approval and there was very little time to review the applications in depth." "This process allowed staff to gain further insight into the organizations that applied and what the funds would be used for if awarded." "Staff gave priority to applicants whose primary objectives were philanthropy and social well-being and whose maximum impact was on Johns and Wadmalaw Islands as well as used large volunteer participation, collaborated with other organizations and leveraged their funding sources." "The staff made their recommendations.... The Ways and Means Committee could change, remove, or add to any of the recommendations. Their recommendation was given final approval at the [next] Town Council meeting." "The Town received 29 Charitable Contribution applications totaling $341,904." This town newsletter article shared some insight into how one funder operates. This particular funder is a government entity. 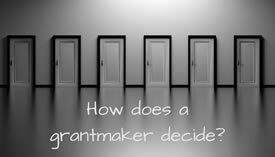 Although every grantmaker is different, there are some universal truths and best practices when it comes to grantseeking. Learn as much as you can about a foundation before applying. You need to know what's important to a funder. Build relationships, ask questions, and learn all you can about the foundation before you apply. Pay attention to changing processes. Foundations are notorious for closed application processes. Yet sometimes, a foundation will open (or add) a grant cycle. Get on the mailing list, stay connected to the foundation staff, and don't miss an opportunity to apply. Pay attention to changing priorities. From time to time, funders will change focus areas. Some, like the Ford Foundation, have narrowed their focus. Others, like the Z. Smith Reynolds Foundation, adapt to changing needs. Sometimes, a foundation may even accelerate their giving, like the Brainerd Foundation, which will sunset in 2020. Know that foundations typically receive far more requests for support than they are able to fund. As a result, a foundation may look more favorably upon smaller requests. One of the best ways to keep yourself in consideration is to ask for an appropriate amount - not what you need, but what the foundation is likely to fund. You can find out what a foundation has awarded previously by using a 990 to research a foundation. Remember that, even when you get a grant, you may not get what you asked for. These are just a few tips that I share in my grant writing workshops. As a former program officer, I bring my own experiences and perspective about what happens inside a grantmaker's office. And I want to share my experience with grantseekers like you. Perhaps you'll join me for a Grant Writing Boot Camp this fall. I'll be in at least ten cities before the end of the year. You can view the current training schedule here. And if you'd like to bring a Grant Writing Boot Camp to your community, contact us. We'd love to hear from you. Want to learn tips and tricks that can make your grants more competitive? Laura Rhodes can help.